When you are craving a particular food….is it the taste of the food you want…or the texture (or both)? Two years ago, I started doing more research into the taste, smell and texture of food and that’s when it hit me — all of the crazy food combinations I’ve come up with over the years all revolve around one thing…texture. Mixing fresh, dried and tinned fruit…adding nuts and water chestnuts to a stir fry…adding simulated bacon crumbles/bits to mashed potatoes…why I like casseroles way more than having all of my food separate on a plate…all of these are explained by my need for copious amounts of texture in each bite. Even my 25 year Diet Coke habit came down mostly to just wanting the sensation of bubbles on my tongue (I group this in with texture because carbonation stimulates the same nerve on your tongue as texture does). So I’ve started asking my weight management clients about this and so far, everyone has been in agreement. A meal which is all roughly the same texture (eg. Rice and dhal or even salad) is not nearly as satisfying as a meal with multiple textures, and is therefore likely to contribute to having the “munchies” (aka cravings) later on. 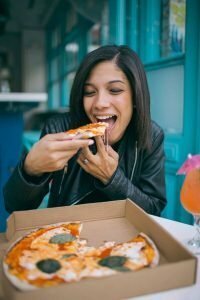 But when you think about it, it actually makes perfect sense – when people get the munchies they often go for biscuits or crisps/potato chips — foods with a lot of crunch and texture. Toast with melted butter is another popular choice — where you have the crunch as well as the warmth of the toast and the sensation of melted butter on your tongue. Chocolate is always popular and an incredibly difficult food to substitute, because it is the only food which changes from a solid to a liquid in your mouth (assuming you choose a good quality chocolate). Even my clients who have been on meal replacement milkshakes tell me how much they struggle to control their eating after being on shakes for a long period of time…perhaps this creates some type of a texture-deficiency? I know when I ate puréed food for a week (to better understand my clients who are on texture modified diets), I have never craved freezing cold foods (like ice cream and tinned fruit out of the fridge) so much in my entire life. It all makes sense now, since texture, coldness, spiciness and carbonation all stimulate the same nerve on your tongue. It seems if you are missing out on one of these, your body starts to crave the others in order to help meet this need. This theory also seems to explain why people who live on take-aways, ready meals and processed foods (eg. Pot noodles) — foods where the texture variety is minimal — also tend to eat more biscuits, crisps, chocolate, ice cream and fizzy drinks. Maybe their brain is trying to meet it’s need for texture? It would also explain why fast food is so popular these days, since a typical fast food meal provides texture heaven – a chewy burger, hot and crispy fries and a drink with lots of ice and fizz.